For those of you who haven’t yet heard about Eating the Road, it’s a fun little food blog that has gotten some attention for their positively awesome flowcharts. 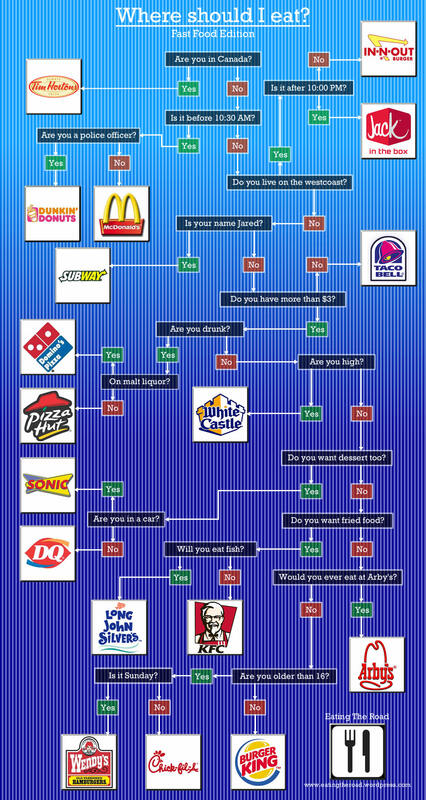 If you haven’t seen any of them, lets start by checking out their Fast Food edition. Don’t let it melt your eyes when you first look at it, you have to commit to a couple minutes of reading it through, in which case it is definitely worth it. I’ve included an image below, but if you have trouble viewing it (you will, it’s too small) then click over to the full size image HERE and then stop back and let us know your comments on the Flowchart, what you found most amusing etc. That is pretty awesome, plus I fully agree with their assessment. i prefer the cereal flow chart.